I know that many fake watches companies build their business on our need of owning beautiful designer watches at affordable prices, but, still, the security of the transaction, of our credit card info and personal details should be more important than any price opportunity. Is Watchonlineforsale.co.uk a secure website? Let’s find out! 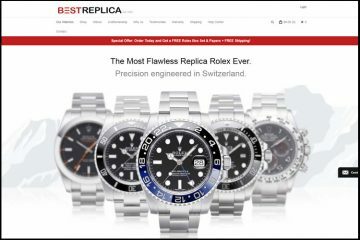 I sure love a replica store that takes the time and effort necessary for creating a unique and elegant website. Apparently, this is what Watchonlineforsale.co.uk did. It dared to think outside the box and took its chances with a template that I haven’t seen anywhere else on the web. The webpage is designed to be easy on the eyes, simple to use and classy. The color scheme is white and black, enriched by beautiful banners. 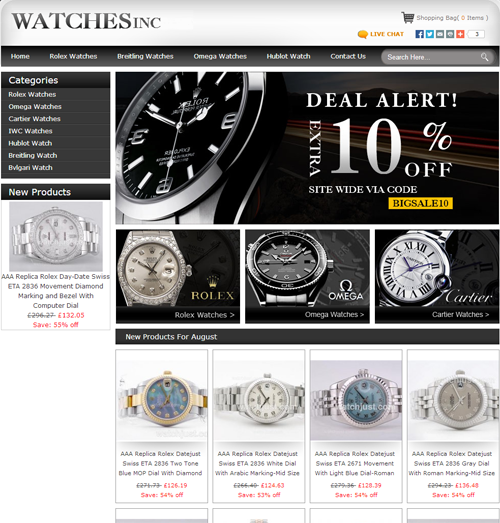 Its appearance is the one of a serious and professional replica watch company. There are two menu bars: one at the top that lists just four brands and one on left side of the page that includes 7 brands. As you can notice, this company cherishes simplicity. 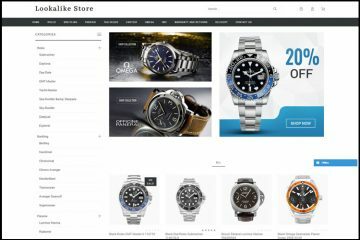 In the center of the homepage there is a medium size banner promoting a 10% discount, and bellow it there are three small banners with links to the most important watch brands: Rolex, Omega and Cartier. I have to say that Watchonlineforsale.co.uk does not offer such a wide or diverse collection of replica watches. There are only 7 brands available, but thankfully each brand includes a couple hundred items. These are nicely organized into sub-categories that have the same name as the original collections. This is really helpful for finding the desired model in less time, especially as there is no filter or advanced search bar included in this webpage. You just need to be patient and view all the models until you find the one that interests you. The replica watches provided by Watchonlineforsale.co.uk cost about 100-140 GBP. All the prices are displayed in GBP. The problem is that for some of them the description says Swiss ETA movement and for others it says Japanese Myiota movement, but either way the price is the same. This is very odd as, naturally, when the quality is better the price is also higher. Additionally, if we check the description closer we see that for some fake watches the name says Swiss movement while the actual description says Japanese 21 jewels. So which one is it? Besides this huge mistake, the description isn’t that well-made or informative. It is quite short and ambiguous. It only mentions the type of movement, the kind of stainless steel, the case size and type of crystal. I don’t know why replica companies promise something they are unable to fulfill. For example, why say you are able to accept Visa, American Express, Discover, Maestro and Mastercard, when in fact you can only process Visa card payments? This is such a despicable business practice which only convinces your potential customers that you cannot be trusted. I seriously advise any online shopper to never buy anything from a company that only takes Visa card payments and lies about it. If you ask me, it looks like a trick designed to get your card details. Another reason why you should buy from Watchonlineforsale.co.uk: it does not provide any information about its delivery and return policies. The page that is supposed to be for Delivery and Return policy has the same text as the Privacy page. The website is full of errors and contradictory information, but this tops it all. Except the fact that the shopping cart informs us of the free delivery for all orders, there is no other piece of information on the website that tells us with what shipping company the package will be sent, how much time will it take to arrive and what are our options if we receive the package and we do not like it. Pictures: These pictures are of terrible quality and what is even worse is the fact that these are definitely copied from 3-4 different sources. You can very easily tell this by comparing the background, the position of the watches, and the clarity of the images. This makes us wonder if the company does exist and if they deliver what we see in the pictures. Furthermore, some of the photos are watermarked with a different company’s name: watchjust.com while others have no watermark at all. All these inconsistencies and fraud signs should be seen as a “beware warning”. No serious and trustworthy company would ever copy product pictures from different sources and pass them as its own. Customer service: Customer service is the best way to figure out if a replica watches company can be trusted or not. 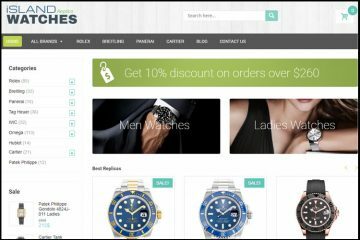 If it has a friendly and responsive customer service then you can be sure that this store will always treat its customers with professionalism and fairness, if it has some bogus email address and no phone or chat service then you can be sure that it will either take your money and send an inferior product or send nothing at all. Watchonlineforsale.co.uk has, from my point of view, a pretend customer service. It has a chat button on the top of the page that does not work. 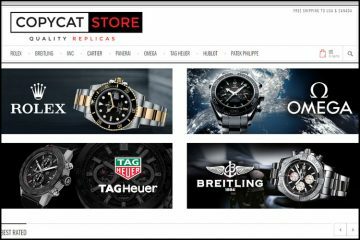 The only thing it does is to direct you to the Contact Us page where you find out that you can reach the company only by Contact Form or by emailing them at [email protected] This email address isn’t even related to the actual domain name of this fake watches store. Summary: Watchonlineforsale.co.uk looks like a pretty shady online replica store. Judging from an objective point of view there is nothing at this company that convinces us to shop here. It has just a few available brands, the description page is full of erroneous information, it pretends to accept numerous payment methods when it can only process Visa cards, it does not say a thing about its shipping and return policy, the product photos are copied from different sources and it does not provide a responsive customer service. My advice for you is to stay away from this company.